Abuja Federal High Court served an order to release ex-National Security Adviser (NSA) Col. Sambo Dasuki (retd) on bail on the Director General of Department of State Services (DSS) and the Attorney General of the Federation and Minister of Justice. The bail conditions of the ex-NSA, Col. Sambo Dasuki (retd) have been fulfilled, the ex-NSA’s family and associates are awaiting a positive response from the Federal Government and the DSS. Dasuki’s counsel Mr. Ahmed Raji (SAN) confirmed this development yesterday. 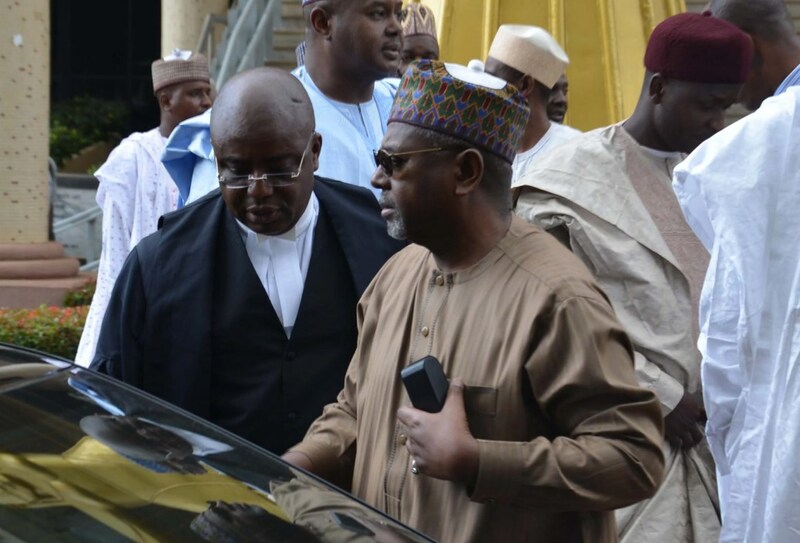 Family members, friends, associates and well-wishers of Dasuki yesterday stormed his Abuja residence in anticipation of his final release from the DSS’ detention, where he has been held by the Federal Government since December 29, 2015. The court, on July 2, granted Dasuki conditional bail, which he had perfected fully yesterday through his two sureties, who are standing for his freedom as ordered by Justice Ijeoma Ojuku. Although the sureties had anticipated that the detained ex-NSA would be handed over to them, sources, however, said the DSS boss might need to contact the Presidency before finally handing over Dasuki to the sureties in compliance with the judgment of the Federal High Court. The warrant of release dated July 16, 2018, titled: “Verification of Bail Conditions” and signed by Deputy Chief Registrar, Federal High Court Abuja, Mr. Mba Nkem A. Omotosho, was served on the DSS Headquarters and the Office of Minister of Justice in Abuja. The warrant of release read in part: “Pursuant to the judgment order made on Monday, the 2nd day of July 2018, granted by His Lordship, Hon Justice Ijeoma L. Ojukwu, directing various conditions to be fulfilled prior to the release on bail of the applicant (Col. Sambo Dasuki (retd). “Hence, the respondents, the Director-General, State Security Services, and Attorney General of the Federation, are hereby notified as directed by His Lordship for the subsequent compliance of same. “Attached herewith is the enrolled Order of the court and all the necessary bail documents for your perusal and aggrandisement,” it concluded. Before the latest judgment by Justice Ojukwu, Dasuki had previously perfected bails granted him by four different judges of high courts, including Justices Ademola Adeniyi and Justice Ahmed Mohammed of the Federal High Court and Justices Hussein Baba-Yusuf and Peter Affen of the Federal Capital Territory (FCT) High Courts. The ECOWAS Court of Justice had also ordered his immediate release from detention.